These ancient beans are the sort alleged to have travelled to America with the Pilgrim Fathers. I really don't see this myself but they are a pretty and interesting little bean. Scrambling weak growth with small white flowers that set well. The beans really fill the short pods which leads to the somewhat square shape of the mature beans. I tried direct sowing and it failed so for the UK and Northern Europe I'd recommend starting in pots at the beginning of May and planting out towards the end of the month. 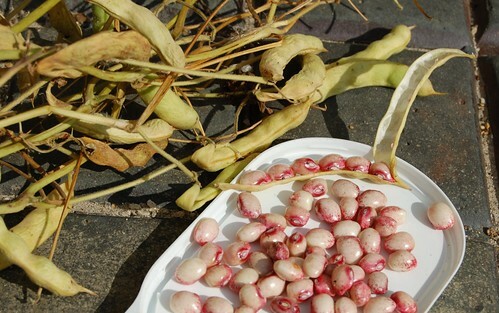 I didn't have enough to try eating them green or as shelled beans - in fact, I don't really have enough to try them as dried beans either but next year should see them trialled for eating.